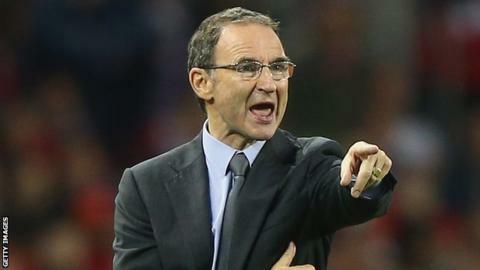 Republic of Ireland manager Martin O'Neill was pleased with the seven-goal winning margin in the Euro 2016 qualifier against Gibraltar even though he had a few grumbles with the display. Robbie Keane's early hat-trick set up the 7-0 romp over the Group D minnows and O'Neill lauded the veteran striker. "He is our ace goal-scorer," said the Republic boss. "But I thought in the last 20 minutes, we got sloppy. We could have conceded a goal which would been irritating." O'Neill acknowledged that Keane was the ideal marksman to have on duty in a game which was always likely to produce a plethora of Republic chances. The LA Galaxy striker's hat-trick brought up his international goals tally to 65 in 136 internationals and he became the leading scorer in European Championship qualifying history as his 21 total edged him past the haul of ex-Turkey forward Hakan Sukur. "He's 34 years of age. He's spent a little time in America but it doesn't seem to have affected him too much. "He was the one that you would be depending on getting goals particularly in matches like this when you are looking for someone of proven pedigree." Keane was totally unaware that he had set a new European qualifier goals record until after the final whistle and played down his latest accolade.
" I'm not too bothered about it at the moment. Years down the line, it's the sort of thing that I'll look at," said the Republic captain. The Republic's record goal-scorer said that his early goal had been the key to a highly satisfactory night for the home side. "The most important thing was to get an early goal and put them on the back foot." After scoring his third international hat-trick, Keane is now very much in the frame to start against Germany on Tuesday night even though there is a school of thought that starting two games in four days might be a big ask for the veteran. "I'm part of the team but it's the manager's decision. Whatever he does I'll be fully behind him." Whether he does start or not, Keane believe that the Republic can cause the world champions problems in Gelsenkirchen. The Germans head into Tuesday's contest after being shocked 2-0 by Poland on Saturday night in Warsaw which moved the Poles to the top of Group D.
"We have a good squad of players - regardless who plays on Tuesday," added Keane. "Obviously, they are world champions but I certainly believe we can get something out of that game." Norwich playmaker Wes Hoolahan must be in the frame to start in Tuesday's game after a performance which impressed O'Neill. "I thought Wes did very well. Very well," said the Republic boss. "He played some brilliant balls tonight and I am delighted that he got a goal." O'Neill was also happy to report that initial assessments indicated that his players had sustained no major knocks in Saturday's game. Read more on Roy Keane: Kevin Kilbane on "a whole different ball game"